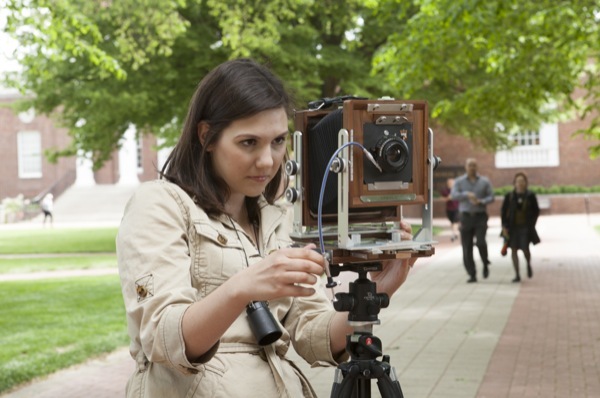 Candice Myruski uses a large-format camera to re-create photos on campus that were originally taken in the early 20th century. 1:22 p.m., Oct. 21, 2013--From a website about Chinese immigrants building the transcontinental railroad to digital re-creations of historic Delaware photos, projects in the humanities at the University of Delaware are increasingly making use of technology to enhance research and student learning. Several of these projects were showcased last week at a session of the Public Humanities in a Digital World lecture and workshop series. The ongoing series is hosted by the Interdisciplinary Humanities Research Center in the College of Arts and Sciences. “Digital resources are building bridges between disciplines on our campus,” center director Ann Ardis, deputy dean of the College of Arts and Sciences, said in introducing the speakers. UD faculty members and students gave brief overviews of their digital humanities projects, and the group discussed ways to expand and expedite the use of technology in a variety of academic areas. “Rephotography,” a project in which graduate student Candice Myruski and David Ames, director of UD’s Center for Historic Architecture and Design, are re-creating photos taken in the 1920s and ‘30s by Delaware documentary photographer Roydon Hammond. They are using a sophisticated combination of traditional film and digital work, which Myruski said gives researchers working with the images “the best of both worlds.” Another digital tool, Google Street View, has been essential in pinpointing the locations of Hammond’s photos, Ames said. April Veness, associate professor of geography, presented an overview of her continuing project focused on the history of Newark, Del., which began in 2007. Over the years, she and her students have interviewed numerous individuals and collected a great deal of material, which has evolved into a multimedia project, she said. “The goal is high-quality, digital storytelling” that can be shared with the public, Veness said. “Engaging Communities Through Museums,” a project in which Katie Bonanno, an undergraduate art conservation student, is focused on the history of the New London Road area, home to Newark’s oldest African American community, and has designed a series of interactive programs to accompany University Museums exhibitions. Museums are exploring new ways to use technology in their outreach, Bonanno said, and the New London Road project helps inform UD students and others about this part of Newark’s history. “My view is that museums can embrace new technology and make community engagement a priority,” she said. The Public Humanities in a Digital World series is co-sponsored by the UD Library, IT-Academic Technology Services, the College of Arts and Sciences and the Department of English.